Still-video cameras, or SVCs, are electronic cameras derived from television technology. Unlike a digital camera, images are recorded in the form of analog scan lines (typically onto a compact Video Floppy disk, which by the late-1980s had become an industry standard). Standard television uses interlaced images, where every other scan line is recorded as a single "field." 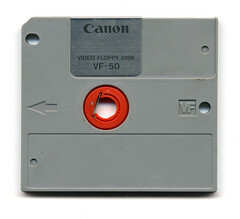 Many SVCs had the ability to combine two field images into a single "frame" image, with higher resolution—although this halved the number of images a video floppy could hold (from 50 to 25). Pages in category "Still video"
This page was last edited on 15 October 2014, at 17:49.